Are you having any homework challenges now that the kids have been in school for a while? It’s important to help your child find a “homework rhythm,” as well as identify tools that are most effective. Having worked with hundreds of youth on the autism spectrum, I find that the following strategies help prepare students for homework success. Many parents think their children should do homework as soon as they get home from school, but this might not be the best time for your child. Children—particularly those with autism—often need time to decompress and unwind after school. Some early birds are at their best doing homework before the school day starts. 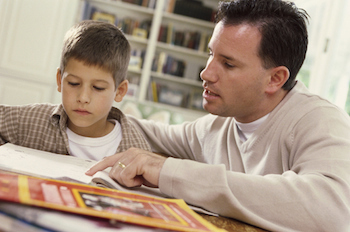 Whatever the best time of day is for your child, schedule homework on the calendar and stay as consistent as possible. On days when activities conflict with the schedule, discuss that with your child and reschedule as needed. Pages upon pages of schoolwork can be overwhelming and feed anxiety. Schedule fun activities to break up the time spent on homework. Agree on how much work to complete or how much time to spend before taking a 5–10 minute break. Whether it’s playing with toys, drawing or playing music, allow your child to do what he loves as a reward. It will help increase motivation to complete the schoolwork. In addition, take what may seem like large, insurmountable assignments and break them into manageable pieces. For example, transcribe one math problem to a page. Tackle a writing assignment by making a list of steps first (include everything from planning to editing). The first step is often best done with a bubble map. This visual brainstorm will help your child organize ideas. Children on the autism spectrum often process visual communication tools better than verbal ones. If this is true for your child, use it to his advantage. A visual calendar is essential. Scheduling homework on the calendar creates a clear routine. Don’t forget to add the fun activities planned for breaks. Depending on your child’s communication style, images of objects or activities (such as a picture of a notebook) may be more effective than writing the word “homework.” The same is true for bubble maps previously mentioned—use pictures or photos instead of words to help translate ideas. Another tool that helps students stay on task is the Time Timer, a visual timer that clearly shows how much time remains for homework and breaks. Michaela Ene, PhD is a licensed psychologist and program director at Fred Finch CARES in San Diego. She has over 20 years of experience working with children, adolescents and adults with autism spectrum disorders and related developmental disabilities.